Rachel says: I met Nick in London, I had just moved back to the Lake District in North West England a couple of months before. I was visiting a friend in the big city when we had a chance encounter in a theatre box office in Covent Garden. He had a takeaway peppermint tea in hand and came in to do a shift at the same place as my friend. Instantly Nick charmed me with his gorgeous accent and funny personality. I knew that despite the distance we would see each other again. Since then, we’ve managed to make our relationship work despite the distance. Nick is in Edinburgh, enjoying his acting career and I am working hard at Aspire in Cumbria, England. He is passionate about his home town, his enthusiasm for the place is infectious but to be honest, it’s hard not to fall in love with the place. Edinburgh is the most stunning and enchanting city. If you have never been to Edinburgh then the film, the Illusionist manages to capture some of the cities essence and is well worth a watch. Nick is not only the most handsome man I have ever come across but the most honourable. I think he looks dashing in his kilt and I found it difficult in our shoot to keep my hands off him! (Which Jessica will attest to after editing the images!) But in all seriousness, I admire how much respect he gives his roots in Scotland an the family history, his knowledge of which fascinates me. Edinburgh as a location leaves a creative person spoilt for choice; the architecture, landscape, spirit of the place, are are dream. It was such a memorable experience, having our shoot in a city that we both love. Jessica has managed to capture our connection in these images, thank you so much! Nick says: Edinburgh is my hometown, and I couldn’t have grown up in a more beautiful, unique, and inspiring city. It takes your breath away each street you turn into, with a mixture of ancient buildings and castles, with other parts of Georgian elegance. Walking around hand in hand, seeing the mix of architecture, the stunning views, mixed in with great galleries, parks and of course pubs, I think I’ve found a new level of appreciation to my fair city. As for my kilt, it is the national outfit for men of Scotland. Usually, when a man has stopped growing, he will be fitted for a kilt. They are 8 yards of wool, spun by large looms further north into the highlands. You would get the kilt in the family tartan, a pattern unique to each family name. Whilst I don’t have one for name my father gave me (Jones), I am allowed to wear either the Hunter or Johnstone tartan from my family tree. The pattern is unique to each clan, and they come in many different colours and styles. Usually, a clan has a ‘dress’ tartan which could be quite bright, and a ‘hunting’ tartan, with more muted colours traditionally worn when out hunting. In the pictures with Rachel I am wearing my kilt which is in a hunting Johnstone tartan. I love wearing my kilt, its usually worn for weddings, special parties and black tie events, and also when the national team plays football (soccer) or rugby. More and more men have started to wear them more casually, and its great to do so, playing with the traditional styles and seeing what works and what doesn’t. And also, I’ve yet to meet a girl or guy who doesn’t like seeing a man in a kilt! Congrats you guys + thanks so much to Jessica Claire for letting me share some of her lovely photos! You can see even more from their session here on her blog. that was just breath taking! such a beautiful couple! So gorgeous! I love her red tights!!! They’re so awesome looking! Love their how they met story, too. Such an amazing location! Love their style! I’d love to go there and take my anniversary pics!!! What a fabulous shoot… her outfit is perfect!! 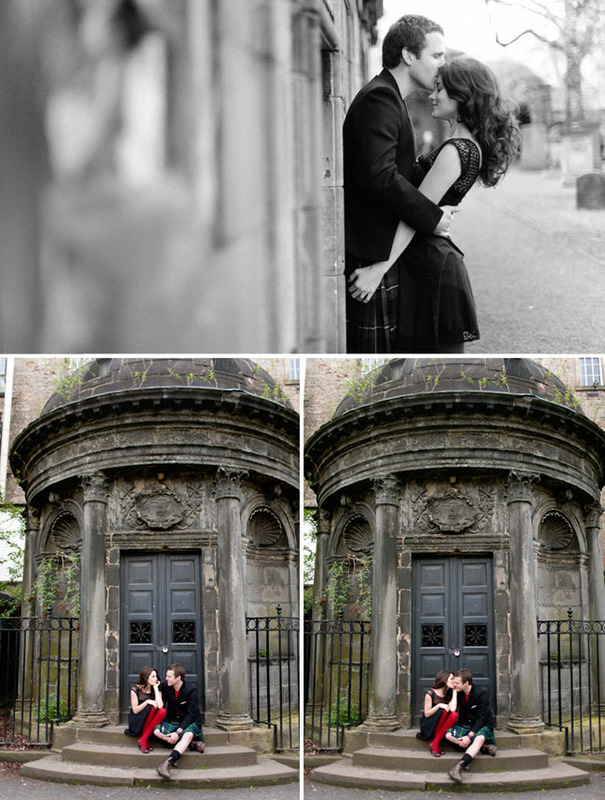 Edinburgh is such a great city… this has me longing to go back!! Love it! 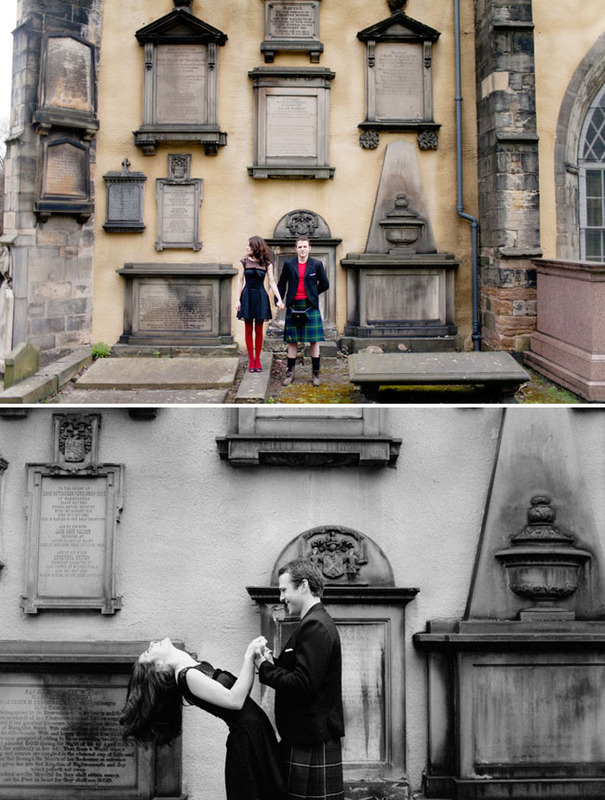 My husband and I sent 2 days of our honeymoon in Edinburgh. Definitely, one of my favorite cities. These pictures bring back such fun memories. And Rachel… she is absolutely stunning! Beautiful pictures! Her outfit is perfect! Where is the dress from? love the shoot, the black dress is gorgeous! Could anyone tell me where to buy that wonderful little tartan hat? They make a beautiful couple . As a French , I hope when I will visit Alba that I will see just one man in kilt , I find it very beautiful and leaving without that sight , I would be upset .